1. How often will the tub be used and what will be its primary use? If you are someone who take a shower most days and only uses the bathtub for the occasional relaxing soak than you may not wish to invest as much space in the tub as someone who uses it every day. A combination bathtub and shower stall may be the best way to meet your needs and style provide you with a comfortable place for the occasional bubble bath. 2. Where would you like to place the tub?How much space do you have? Space considerations will obviously play a large role in helping you narrow down your choices. The amount of space you have as well as where drains and plumbing is located will be important considerations in replacing a tub as moving drains and pipes can become a costly and time-consuming endeavor. 3. 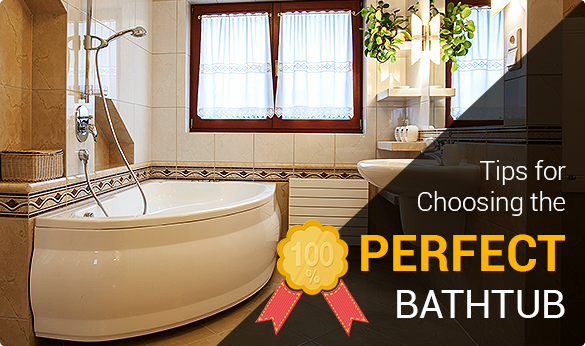 What designs or styles might best fit your bathroom décor? If your bathroom is very modern in appearance, a large clawfoot bathtub may not be the best choice in order to match your style and décor. Similarly, a very traditional space may be not the optimal location for a Japanese style sitting bath but sometimes styles can be combined to create interesting and eclectic spaces. Consider the atmosphere you are trying to create and bring photographs of your current bathroom with you when you shop. 4. What materials would look best and last the longest? Replacing a bathtub can require a large investment of your time and money so it behooves you to carefully consider how long a given material will last before making your purchase. Choose a material which matches your décor but will stand the test of time as tubs can take a good deal of work to install and you want something that will work – and look – great for years to come. 5. Are my needs or design style going to change in the next few years? Moving and replacing bathtubs can be a lot of work so be sure to consider how your needs or style may change in the coming years. If you are considering moving, you may wish to spend less money by opting not to purchase that giant whirlpool tub you are eyeing and settling for something more affordable and universally attractive.